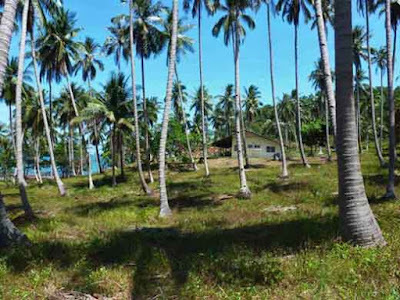 Last Friday’s guest post by John Lukens (A Thai Holiday and Oil Palms) described how he and wife Thitiya traveled from their home in Bangkok to spend a few days with their friends Tiew and wife Aew in Ranong, where they had the opportunity to learn about oil palms. The learning opportunities didn’t end with oil palm. Another early night and early breakfast. Tiew’s driver took Aew, Thi and me back over the mountains to a beach bungalow about 9 miles (15 km) north of Lang Suan, in Chumpon, on the Gulf of Thailand. The bungalow, whose verandah looked out to a blindingly white strip of sand, was on a small hilly peninsula in the middle of their coconut plantation. Our hosts’ bungalow in Chumpon, Thailand. After settling in, I was called by Thi to come quickly. 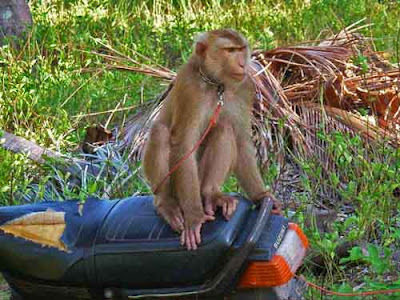 Aew had hired a man to harvest the coconuts, and he was just arriving on an old motorcycle with a small gray monkey on the back of the seat. The coconut-harvesting monkey ready for work. Immediately the monkey, on a long leash, jumped off the seat and awaited instructions. The man pointed to a tree, and the monkey quickly ran up it. I suppose if it weren’t for the leash, it would have been even quicker getting away and joining its mates in the forest. So here’s how to harvest coconuts. 1) Buy a monkey and train it. Small ones go for about 30,000 Baht. (US$1,000). That monkey can harvest about 600 coconuts a day. 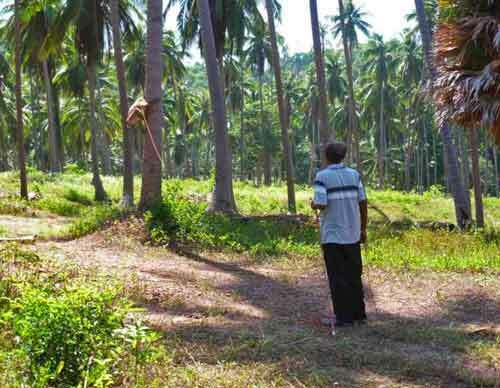 The owner charges the plantation owner one Baht for each coconut harvested. At that rate, you’ve paid off your purchase price in less than a year--depending upon your expenses. The monkey gets fed and watered every hour while working and expects to have a couple of whiskey and sodas in the evening. You can buy a bigger monkey for about 50,000 Baht, and this monkey can harvest 1,000 coconuts a day. But the big ones can get fierce. 2) Show the monkey whether you want green coconuts with lots of milk (really a sweet watery liquid) or older coconuts with lots of meat. This time the owner was after mature coconuts. 3) Point to a coconut palm, and send the monkey up to the top, where the coconuts hang out. Make sure it’s a coconut palm. If it’s a different kind of tree, the monkey gets cranky. They don’t have a sense of humor. 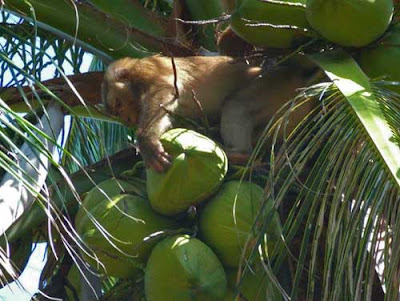 The monkey climbs the selected coconut palm tree. 4) Let the monkey go to work. It selects and grabs the coconut with arms or legs or both and twists it until the stem breaks and the coconut falls. Coconuts are quite heavy and hit ground with a thud. They bounce a bit and can roll some distance. 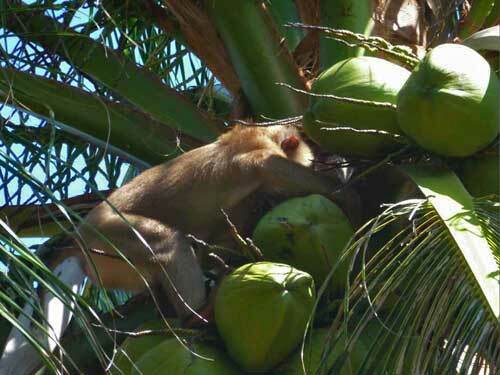 The monkey carefully inspects the coconuts. The monkey uses arms and legs to twist the coconut from its stem. 5) Pile the coconuts using a long stick with a spike on the end. You spear the husk and lift and twitch it onto the pile. 6) Frequently light up a roll-your-own cigarette while supervising the monkey. This lets the monkey know you’re the boss. 7) Ride the motorcycle back home, monkey on back, once you’ve done a good day’s work. Don’t forget to buy tobacco, whiskey and soda. The monkey is ready to go home to relax. It’s that easy. I was impressed. Oh, Thi advised me that Aew doesn’t sell the harvest. She gives it to their caretaker. 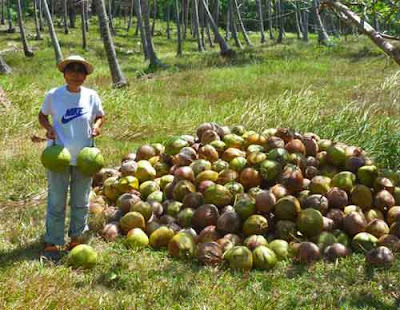 Many thanks to John for his review of oil palm and coconut harvesting in Thailand. And, as always, many thanks to you for stopping by.